The Catalyst PTi-B shares the Quantum PTi-B spinning reel reduced-weight design. Features include eight PT bearings, durable multicoated finish, LMS Line Management System, MAGLOK continuous anti-reverse, improved TiMag titanium bail with magnetic trip, a stacked ceramic front-adjustable drag, and a machined-aluminum collapsible crank handle. "Well I was debating over this or another shimano, Not dinging shimano great reels! But this Quantum is up there with them easily! Flawless drag system smooth smooth reeling! and very good casting! 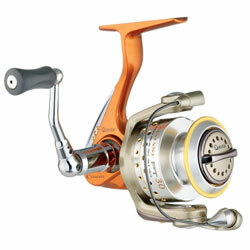 Very nice reel I am happy with this purchase." "Quantum has finally addressed some of the short comings of this reel. They have reduced the weight, they have redesigned the bail arm screws so they don't constantly back out and seize the reel and they also have the bail system working great..."